controls density of mussel population. for marine diseases yet seen. up and down Pacific Coast. Oh, that is so sad 😦 Thanks for sharing the plight of the sea stars with such a beautiful images. Thank you,Connie, for your concerned response. It is a very sad ecological situation; worsened by how helpless it makes most people feel. So sad that this wasting is destroying the sea stars on the coasts. And we don’t even kn ow why exactly. Thanks Jane, I have several sites to follow but I did not have the Yale 360. I’ll keep up on that one too. these two sites report on what’s going on in the Sound and beyond. Thanks, Ron. I’m in Gig Harbor visiting my daughter. Good to have sites that relate a bit further north! Your suggestions have been added to my RSS feed. Disturbing to see the increasing number of challenges faced by the Sound ecosystems. Just found this, thought you might find interesting. Thanks Jane, this is a sad story so far. The disease keeps moving up the coast and is now well entrenched in Alaska. It might be letting up in WA . I hear that it has happened before and abated. Let’s hope this one does too over time. Good contrast between the photos. First one shows brightly coloured, fully blossoming sea urchins, anemone, and coral (? lower left). A few mussel dishes remain from lunch, while the sea star is reaching for briquettes to start the barbecue. Colourful, vigorous, summer-holiday imagery. The second one is relatively devoid of life forms or gaiety, being mostly limp seaweed and a few urchins gone into hiding. The dead sea star resembles a patient with advanced dementia sitting in a geri-chair, unshaven, unmoving, muscles gone, shoved up against the seaweed so as not to be in anyone’s way. I’d say you’re getting your point across. How beautiful! And how sad. I’ve heard of Sea Star Wasting Syndrome but hadn’t seen an image of it. It is a very sad thing to witness, Cindi. 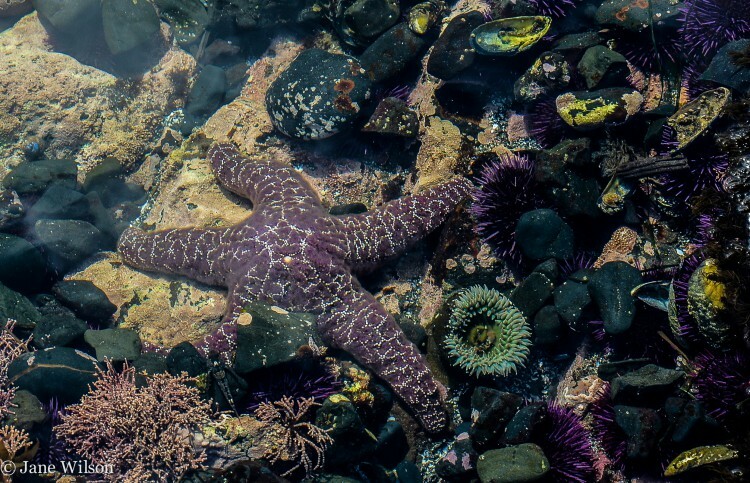 Our tidal pools here in the Northwest have always been filled with an abundance of ochre sea stars… we all mourn the losses and hope that full recovery will one day occur. I hope they will find the cause of this and take action! I wish you a good day! Yes, Christina, it will be helpful when the exact causes are determined. The challenges will likely be sizable, though. With solutions that will entail long-term global commitment to changes in the ways humans view our planetary-ecosystems and our use Earth’s resources.